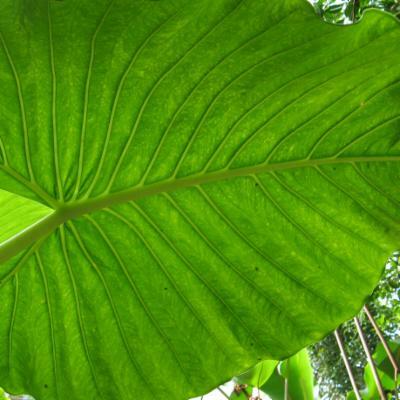 Elephant ear taro is a giant plant with distinctive leaves and is valued as an ornamental. The swollen underground stems are used for food and animal fodder, and the roots and leaves are used medicinally in some countries. For example, in Hawaii, it has been used to treat digestive complaints, as a topical dressing for burns, and as a love charm. In the Philippines, the leaf stalks have been used to relieve toothache and on Java the roots and leaves have been used to relieve pain and redness. The rhizomes contain an anti-fungal protein called alocasin. Elephant ear taro is a massive aroid with a spectacular cluster of upwardly pointing, arrow-shaped leaf blades. The swollen underground stems are used for food and animal fodder, and the roots and leaves are used medicinally in some countries. For example, in Hawaii, it has been used to treat digestive complaints, as a topical dressing for burns, and as a love charm. In the Philippines, the leaf stalks have been used to relieve toothache and on Java the roots and leaves have been used to relieve pain and redness. The rhizomes contain an anti-fungal protein called alocasin. 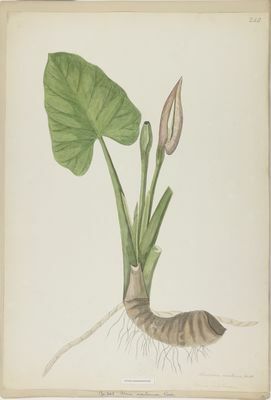 Alocasia macrorrhizos is found throughout IndoMalesia and Oceania. It is not clear where, if anywhere, this species occurs truly wild. It has evidently been distributed widely in tropical Asia in prehistoric times as a subsistence crop and is now pantropical by introduction as an ornamental. 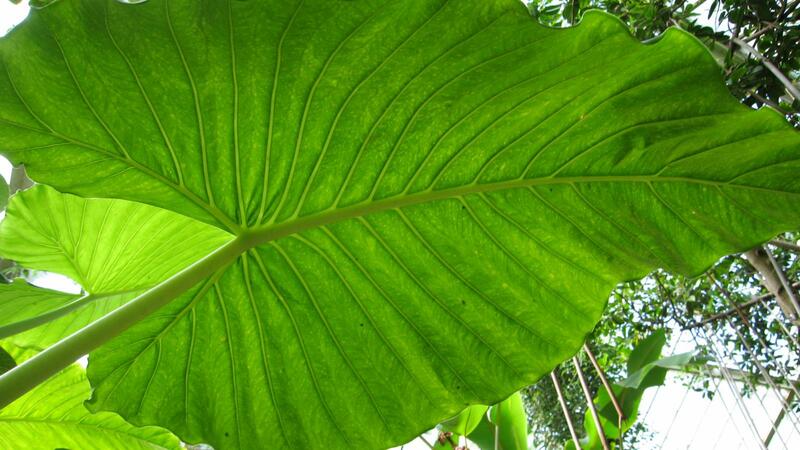 Elephant ear taro is a giant plant with distinctive leaves and is valued as an ornamental. The leaf blades can reach one metre in length. The flowering parts are often inconspicuous, and are partly concealed by the floral bract. This bends back and then falls off at maturity though, to reveal a spike of red berries, each of which contains several pale brown seeds. Elephant ear taro is a massive herb, forming a thick erect trunk in large plants and reaching four metres in height. The leaves are held erect, with petioles (leaf stalks) up to 130 cm long. 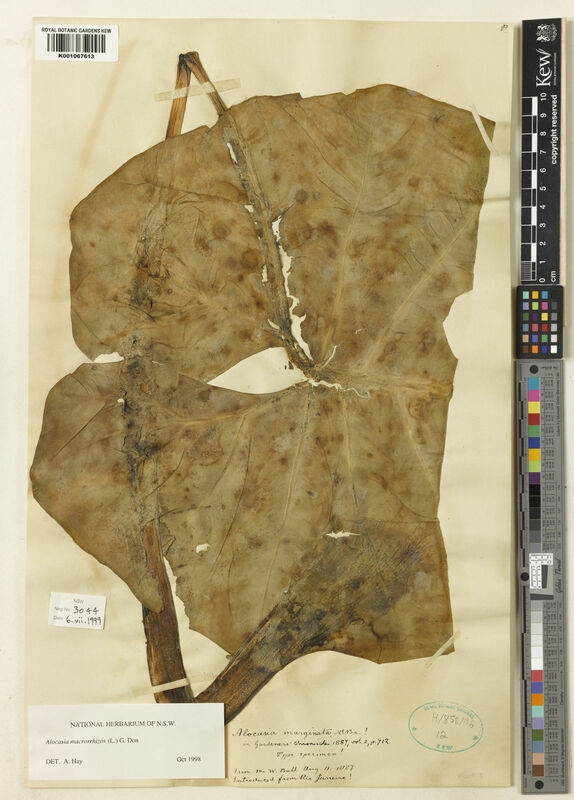 The leaves are stout, with sheathing in the lower part. The leaf blades are arrow-shaped, bluntly triangular in general outline with somewhat rounded basal lobes. There are about nine main veins, diverging at an angle of about 60 degrees. The inflorescences (flower stalks) occur in pairs amongst the leaf bases, preceded by a cataphyll (scale leaf). The spathe (floral bract) is about 13 to 35 cm long, constricted about 1/6 of the way from the base, with the lower part folded into a green tube. The limb is oblong, pale yellow, cowl-like when in flower, then bending back and deciduous. The spadix (flower spike) is slightly shorter than the spathe. The lowermost 1 to 2 cm of the spadix is female and covered with about 30 pistils (female parts). Each pistil consists of a pale green ovary with a yellow 3 to 5 -lobed stigma sitting directly on it. Above the female flowers there is a zone with about four whorls of white sterile organs corresponding in position to the spathe constriction. The next floral zone is male, covered with tightly packed white rhomboid to hexagonal male flowers. At the tip of the spadix is a yellowish appendix, which is at least half the spadix length and covered with tiny irregular furrows. The fruit is a few-seeded red berry, which when ripe is exposed by the recurving segments of the lower spathe tube, which detaches on maturity. Each berry has several pale brown seeds about 4 mm in diameter. The rhizomes (swollen underground stems) of Alocasia macrorrhizos are traditionally eaten as a starchy food throughout IndoMalesia and Oceania. 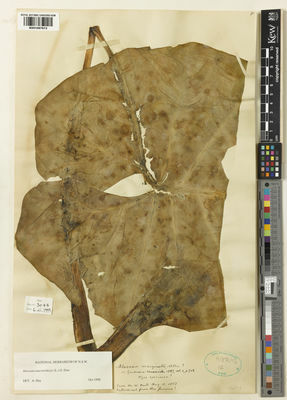 It is thought to have once been a major staple food in Micronesia that became extinct there prior to the introduction of related taro species (for example Colocasia esculenta ). The rhizomes are used for animal feed and famine food for people. They require prolonged preparation and boiling or roasting to rid them of stinging calcium oxalate crystals. Today, Alocasia macrorrhizos is a popular ornamental plant grown for its large foliage and striking aroid inflorescences. It has also shown promise in sewerage treatment, as it grows rapidly in wetland conditions and has a propensity to accumulate metal contaminants such as zinc. Tropical humid forest. Commonly found growing around human settlements. This species has not yet been assessed against IUCN red list criteria. The rhizomes (swollen underground stems) contain stinging calcium oxalate crystals. Cultivada en Colombia; Alt. 0 - 200 m.; Islas Caribeñas, Pacífico. Massive pachycaul, usually eventually forming a thick erect trunk, to c. 4 m tall, usually more or less devoid of old leaf bases; leaves several together, held erect; petioles to c. 130 cm long, stout, sheathing in the lower c. ½, eglandular; wings of sheath persistent, straight to somewhat recurved; blades sagittate, bluntly triangular in general outline; anterior lobe c. 70 cm to over a metre long, c. 60 – 90 cm wide, with c. 9 rather distant primary lateral veins diverging at an angle of c. 60 degrees; glands in axils of primary veins distinct; secondary venation flush with the lamina or but slightly raised abaxially, not forming interprimary collective veins or these poorly defined; posterior lobes c. 1/3 – ½ the length of the anterior, somewhat rotund, often overlapping; inflorescences paired amongst the leaf bases, subtended by a cataphyll; peduncles barely exceeding the cataphylls at anthesis; spathe variable in length, c. 13 – 35 cm long, constricted about 1/6 of the way from the base; lower part green; limb oblong, cowl-like at anthesis, later reflexed, then deliquescent and deciduous, membranous, pale yellow; spadix slightly shorter than the spathe; female zone 1 – 2 cm long, c. 1.5 cm diam., with c. 30 pistils; ovaries pale green, close-packed, c. 3 mm diam., unilocular; stigma sessile, 3 – 5 –lobed, the lobes conical, yellow; interstice of sterile organs slightly shorter than to equalling the female zone, of about 4 whorls, white, slightly constricted corresponding with the constriction of the spathe; male zone cylindrical, c. 2 cm diam., c. 3 – 7 cm long, white; synandria rhomboid-hexagonal, with slightly convex tops, 4 – 6 staminate, with the anthers opening by lateral slits not reaching the top of the synandrium; appendix yellowish, slightly thicker than the male zone at the base, thence tapering, equalling to considerably exceeding half the length of the spadix, staminodial; fruit a few-seeded red berry exposed by the recurved segments of the dehiscing lower spathe; seeds several, c. 4 mm diam., pale brown, strophiolate. Pachycaul herbs, massive, to 4m, evergreen, latex slightly milky. Stem erect, to ca. 1.5m, decumbent. Leaves several together, clustered at tips of stems in larger plants; petiole to 1.3m, sheathing in proximal 1/3–1/2; leaf blade light green on both surfaces, ovate-sagittate, bluntly triangular, up to 120 × 50cm, ± erect, margin entire to very slightly sinuous; posterior lobes 1/3–1/2 length of anterior, somewhat rotund, often overlapping, naked in sinus in mature plants, weakly peltate in juveniles; primary lateral veins ca. 9 on each side of anterior lobe, axillary glands distinct, secondary venation not forming interprimary collective veins. Inflorescences paired among leaf bases, subtended by membranous cataphylls; peduncle barely exceeding cataphylls at anthesis. Spathe 13–35cm, constricted ca. 1/6 from base; proximal spathe green, ovoid; limb cowl-like at anthesis, later reflexed, then deliquescent, pale yellow, broadly oblong-lanceolate, 10.5–29cm. Spadix slightly shorter than spathe, shortly stipitate; female zone conic-cylindric, 1–2 × ca. 1.5cm; pistil pale green, ca. 3mm in diam. ; stigma yellow, sessile, 3–5-lobed; sterile zone slightly equaling female zone, whitish; synandrodes rhombic-hexagonal, ca. 2.5mm in diam. ; male zone whitish, cylindric, 3–7 × ca. 2cm; synandria 5–9merous, rhombic-hexagonal, convex-topped, ca. 2mm in diam. ; appendix yellowish, slightly tapering, at least 1/2 length of spadix. Fruiting spathe green, oblong-ellipsoid, ca. 8cm. Fruit ripening scarlet, ellipsoid, ca. 12 × 8mm. IndoMalesia to Oceania. It is not clear where, if anywhere, this species occurs wild. It has evidently been distributed widely in tropical Asia in prehistoric times as a subsistence crop and is now pantropical by introduction as an ornamental. Ditches and wet areas of farmlands and wastelands, never away from human disturbance. Andaman Is., Assam, Bangladesh, Brazil Northeast, Cambodia, Caroline Is., Chagos Archipelago, China South-Central, China Southeast, Cook Is., Costa Rica, Cuba, Dominican Republic, East Himalaya, Fiji, Galápagos, Gilbert Is., Guinea, Gulf of Guinea Is., Hainan, Haiti, Hawaii, Honduras, India, Jamaica, Jawa, Laccadive Is., Laos, Leeward Is., Lesser Sunda Is., Malaya, Maldives, Marianas, Marshall Is., New Caledonia, Nicaragua, Niue, Paraguay, Portugal, Puerto Rico, Samoa, Seychelles, Society Is., Sri Lanka, St.Helena, Sudan, Sumatera, Taiwan, Thailand, Tibet, Tokelau-Manihiki, Tonga, Trinidad-Tobago, Vanuatu, Venezuela, Venezuelan Antilles, Vietnam, Windward Is. Mansor, M., Boyce, P.C., Othman, A.S. & Sulaiman, B. (2012). 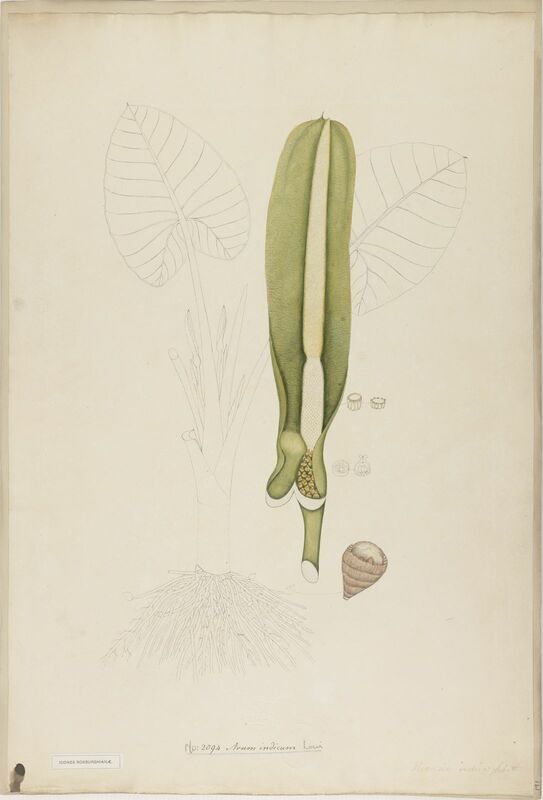 The Araceae of peninsular Malaysia: 1-146. Penerbit Universiti Sains Malaysia. Kurniawan, A., Adjie, B. & Boyce, P.C. (2011). Studies on the Araceae of Sulawesi I: New taxa of Schismatoglottis and Homalomena, and a preliminary checklist and keys for Sulawesi Acta Phytotaxonomica et Geobotanica 61: 40-50. Boyce, P.C. (2008). A review of Alocasia (Araceae: Colocasieae) for Thailand including a novel species and new species records from south-west Thailand Thai Forest Bulletin (Botany) 36: 1-17. Schinini, A. (2006). Adenda a las Araceae de la flora del Paraguay Rojasiana 7(2): 51-62. Samake, M., Wu, Q.-T., Mo, C.-H-. & Morel, J.-L. (2004). Plants grown on sewage sludge in South China and its relevance to sludge stabilization and metal removal. Journal of Environmental Sciences 15: 622-627. Lee, R.A., Balick, M.J., Ling, D.L., Sohl, F., Brosi, B.J. & Raynor, W., (2001). Cultural dynamism and change: an example from the Federated States of Micronesia. Economic Botany 55: 9-13. Hay, A. (1999). The genus Alocasia (Araceae-Colocasieae) in the Philippines. Gardens Bull. Singapore. 51: 1 - 41. Quisumbing, E. (1978). Medicinal Plants of the Philippines. Katha, Quezon City. Akana, A. (1922). Hawaiian Herbs of Medicinal Value. Pacific Book House, Honolulu. Hay, A. & Wise, R. 1991. The genus Alocasia (Araceae) in Australasia. Blumea. 35: 499-545. Moreira de Andrade, I. & al. (2013). The Araceae in Ceará, Brazil: humid forest plants in semi-arid region Rodriguésia; Revista do Instituto de Biologia Vegetal, Jardim Botânico e Estaçao Biologica do Itatiaya 64: 445-477. Leti, M., Hul, S., Fouché, J.-G., Cheng, S.K. & David, B. (2013). Flore photographique du Cambodge: 1-589. Éditions Privat, Toulouse.